The Campaign to Free Ahmad Sa’adat calls upon all Palestinian, Arab and democratic and progressive forces around the world to make the scheduled court hearing for Ahmad Sa’adat – November 25, 2008 – a day to put the occupation on trial! Ahmad Sa’adat is a national leader of the Palestinian people, the General Secretary of the Popular Front for the Liberation of Palestine and an elected member of the Palestinian Legislative Council, and a Palestinian political prisoner alongside over 11,000 of his sisters and brothers. For over two and one-half years, Sa’adat has been imprisoned by the Israeli occupation forces, following the siege on Jericho Prison on March 13, 2006, in which Sa’adat and five other Palestinian political prisoners were abducted by the Israeli occupation military. 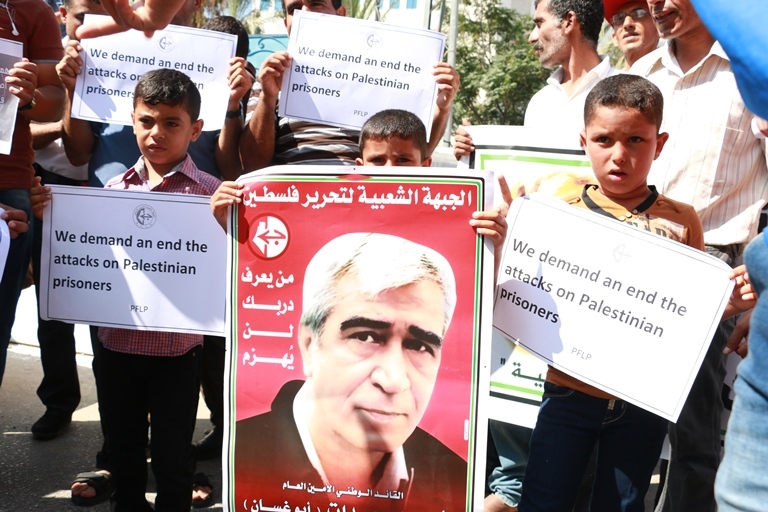 The case of Ahmad Sa’adat is a critical case – a trial of a Palestinian national leader, facing the Israeli occupation and its military forces, the United States, Britain, and the Palestinian Authority. In many ways, it exemplifies both the commitment and steadfastness of Palestinian prisoners and the Palestinian people as a whole to uphold their rights and their dignity, and the collusion of forces – Israel, the US, Britain and the PA – to undermine those rights and attempt to destroy their resistance. During those two and one-half years, Sa’adat has steadfastly refused to grant any legitimacy to the military courts of the occupation. His statements to the court have repeatedly underlined his approach to these military tribunals – rejecting their authority entirely as illegitimate and invalid, the attempts of the occupying authority to utilize a court system to continue its war against the Palestinian people, courts that are in no way systems of justice, but serve, rather, as yet one more mechanism and weapon of the Israeli occupation against Palestinian rights and freedom. His trial has been postponed repeatedly, and the occupation forces have announced that they expect to complete their “case” against him on November 25 and refer the case for sentencing. It is therefore particularly urgent that the case of Ahmad Sa’adat – and his fellow Palestinian prisoners – receive the utmost attention and solidarity of people around the world at this urgent time. It is particularly important to note that Ahmad Sa’adat and his comrades were kidnapped in an assault on the Palestinian Authority prison at Jericho, where he was held in a PA prison, at the behest of the U.S., Britain and Israel, and guarded over by U.S. and British guards. Sa’adat’s case speaks directly to the dangerous and inexcusable practice of “security cooperation” on the part of the Palestinian Authority with the Israeli occupation, as well as to the leading role of the United States (and Britain) in the ongoing assault against the Palestinian people. Ahmad Sa’adat, at the time of his kidnapping, had been held for over four years in a Palestinian Authority prison. Abducted after a staged meeting with PA security official Tawfiq Tirawi, a prime advocate and implementer of so-called “security cooperation” with the occupation forces, he was never charged with any crimes, was ordered released by the PA’s own High Court, yet remained imprisoned, under U.S. and British guards, at the behest of and subject to the whims of Israel. The policy of “security cooperation” dates to the earliest days of Oslo. A fundamental provision of those accords and, indeed, the very creation of the Palestinian Authority, was the agreement of the PA to act as a security force for the occupation, and clamp down, repress and imprison Palestinians who continued to struggle for their rights and for the liberation of their land and people. To this day, “security cooperation” has continued to develop and strengthen, stretching to a present situation in which leading PA security figures share intelligence resources with the occupiers, raid and close Palestinian popular institutions, and make mass arrests on the direction of occupation forces, while holding meetings and coordination sessions with them in illegal Israeli settlements, pledging their willingness to imprison, arrest, torture and even wage military action against fellow Palestinians who refuse to comply with the demands and conditions of the occupation – setting themselves up as a modern-day South Lebanese Army or Contra force. Following the 2006 PA elections, Israel no longer felt assured that the political prisoners in Jericho would remain there indefinitely at its behest, and arranged with the US and British guards for them to desert their position and allow easy access to an occupation military raid. For the entire time of his imprisonment, Sa’adat has been a prisoner of Israel and its occupation – as practiced on its behalf by the PA, the US, Britain and now Israel itself. It is the PA that held Sa’adat in the prison where he was forced to remain, vulnerable and visible to the assault of the occupation forces, keeping him in the view and the full knowledge of the occupation forces throughout that time, and the PA that bears responsibility for his abduction and for any and all penalties and consequences against him meted out by the occupier. Ahmad Sa’adat’s case is one that represents the pinnacle of security cooperation. 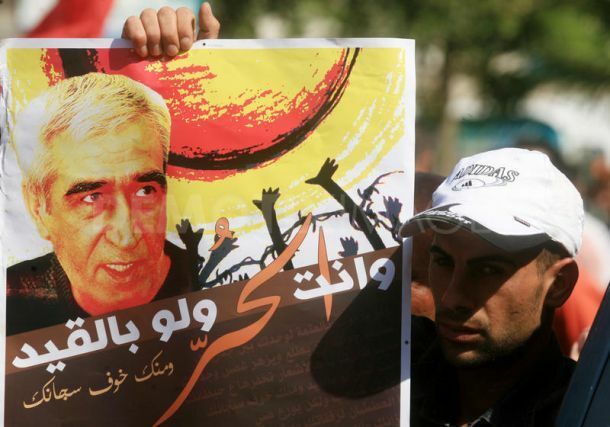 In this environment, when the devastating consequences of security cooperation are on view, it is a necessity that the Palestinian Authority end its silence on Ahmad Sa’adat’s case, escalate its actions on behalf of all political prisoners and completely end the unjustifiable, dangerous and criminal practice of “Security cooperation” and military/police actions on behalf of the occupation. It is particularly shameful to note that the PA held a celebration in honor of Tawfiq Tirawi only days before Sa’adat is to face the military court on November 25. The contrast between Tirawi and Sa’adat – collaboration or resistance, betrayal or steadfastness – could not be more clear, to the Palestinian people, or to the world. Furthermore, the case of Ahmad Sa’adat once again lays bare the high level of responsibility of the United States, as well as Britain, for Sa’adat’s case, the case of all Palestinian political prisoners, and, indeed, the entire Palestinian cause. The United States government provides Israel with over $10 million daily in aid – aid that goes to kill Palestinians, imprison them, expropriate land, build settlements and segregation walls, besiege Gaza and deny refugees’ right to return. It was a US-made missile shot from a US-made helicopter, paid for by the people of the United States, that killed Abu Ali Mustafa and has killed hundreds of other Palestinians targeted for assassination. Palestinians are shot with US-made bullets from US-made rifles, Palestinian homes demolished by US-made bulldozers, and US-made tanks prowl Palestinian streets. Furthermore, in its strategic alliance with Israel, the US has dedicated untold energies into attempting to destroy the Palestinian resistance. The US has imposed conditions upon the Palestinian people, participated enthusiastically in the isolation of Palestinians and an economic embargo against them, and poured money and resources into so-called “Security cooperation.” Indeed, PA security forces are as much creations and employees of the United States as they are of Israeli intelligence. Israel has been a strategic partner of US imperialism for decades and is central to its attempts to shatter the Arab people, divide them, subject them to colonialism and reactionary rulers and US exploitation. The case of Ahmad Sa’adat – from the direct involvement of US guards, to the US weapons used against Abu Ali Mustafa and then in the siege on Jericho, to the US investment in the policy of “security cooperation” and the US direction of an international targeting of the Palestinian resistance, makes clear the direct responsibility of the U.S. not only for Sa’adat but for all Palestinian political prisoners. Following the US elections, there are tendencies that seek to place some sort of reliance upon the actions of the US, or of Israel after its own forthcoming elections. The case of Sa’adat only serves to highlight that the strategic alliance of the US and Israel is not one that benefits the Palestinian people and is, in fact, deeply dangerous to the Palestinian cause, and their elections will do nothing to alter this reality. However, this is a critical time for people in the United States to demand that their tax dollars and the US government cease its aid and support to Israel and end its strategic alliance and its war upon the Arab people, and November 25 is a key day to do exactly that, in the name of freedom for Ahmad Sa’adat and all Palestinian prisoners. Make November 25 a day to put the occupation on trial!